Squirrels are medium sized rodents characterized by their small rounded ears, slender bodies, and large bushy tails. 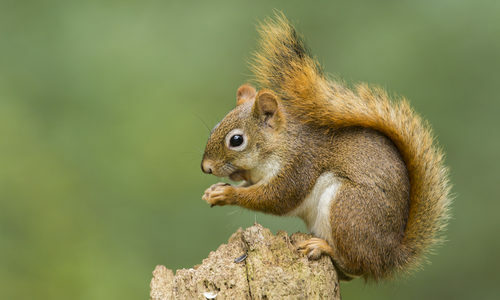 There are approximately 200 different known species of squirrel worldwide, but there are only a few that are common when it comes to problems with infestation in North America. These common species include the gray squirrel (sciurus carolinensis), the red squirrel (tamiasciurus hudsonicus), the flying squirrel (glaucomys spp) and the fox squirrel (sciurus niger). Tree squirrels, like the few species we listed above, commonly nest within trees and wooded areas. They enjoy chewing holes and using those to help them climb or make nests. They’re most active during the daytime, in early hours, and their diet consists of mostly fruit, bark, nuts, seeds, leaves, and the occasional insect. Like similar mammals, they are born live in multiple litters per year. The litters are relatively small, between three and eight, though the exact number depends on the individual species. Squirrels can inflict two varieties of damage if they’ve infested your home or business: psychological and environmental. If they’ve made a home in your attic or similar space, the consistent noise they can end up causing is known to cause psychological pain for home owners unable to sleep, concentrate, or relax without issue. Flying squirrels especially, since unlike most tree squirrels, they are nocturnal. That aside, they can cause damage to your land and lawn by digging holes, shredding trees, and clawing up outer structures and furniture. They also take a particular interest in pulling birdfeeders from trees. So squirrels are not dangerous in a frightening sense, but they can cause dangerous environmental problems because of their love of digging, chewing, and making messes everywhere they make home. You have squirrels because your home is appealing to them and they have found easy ways in and out. They’re attracted to various food sources, especially trees like oak and hickory, and are especially fond of any tree with large reaching limbs that they can climb on and jump from. How can I prevent squirrels? The best way to prevent squirrels from taking up residence in and around your home is through successful habitat modification. An important way to modify your home habitat is by trimming or removing tree limbs within a few meters of your home so that squirrels are unable to climb and utilize these limbs to jump onto your roof. We also recommend removing bird feeders, avoiding the planting of new oak or hickory trees (a favorite food source of many variety of squirrel), and, if you have a garden, install a wire fence with no more than a ½ inch square mesh so they’re unable to squeeze through. If they’re in your home, it’s because they found a way in. Like with any potentially harmful pest, you want to check the exterior of your home and foundation to make sure that there are no holes or cracks that they can squeeze in through. You can also attempt to catch them outside your home through the use of traps with one-way doors placed in strategic locations near potential food sources. How can Gregory Pest remove squirrels from my home or business? A specially trained exterminator from Gregory Pest Solutions will be your full-service pest solutions provider once you call to set up an appointment. We specialize in the effective, humane removal and prevention of squirrels from your home, business, or property. When you hire us to evaluate your home’s problem, one of our professional technicians will be sent to assess the situation and subsequently formulate an environmentally friendly plan for their removal. Once the plan is implemented, we’ll set up prevention measures so that you and your family can enjoy a lasting rodent-free environment into the future.